Did you experience this delight? This thin, moist peanut butter cake topped with a sweet icing was something I looked forward to eating every time it was on the menu. Considering allergy concerns these days, it's probably long gone, and while that's a shame, the good news is that you can make it for yourself at home! This is such a good recipe. It's probably different from every cake recipe you've ever seen, but it yields the most tender, delicious peanut butter cake I've ever eaten. The icing is unique too, and I could probably eat a bowl of it (though my teeth would hate me for it). The recipe I used was intended for a 13x9-inch pan, which would probably give a thinner cake, but I halved the recipe and didn't mind the thickness produced by the 8x8-inch pan; your mileage may vary. 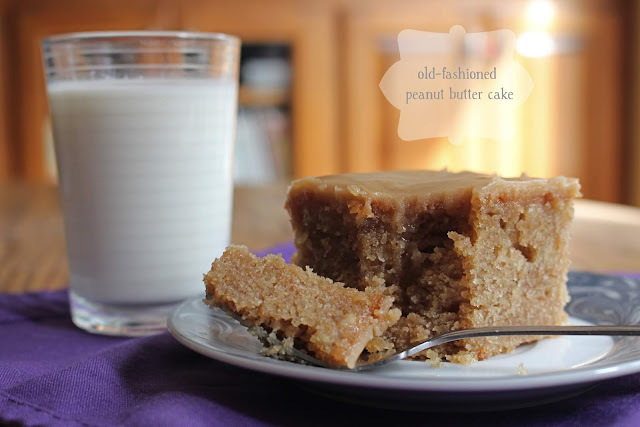 I loved everything about this cake, from its tender crumb to its dominant peanut butter flavor (pregnancy cravings! ), and especially its buttery, sweet, creamy icing. It was even better after the first day--the cake got even more moist and everything just seemed to gel! Was the peanut butter cake of my elementary school cafeteria days as good as this? Nostalgia deems it so! Spray an 8x8-inch pan with nonstick spray. Heat the butter and water in a small saucepan until it comes to a boil. Take off the heat and whisk in the peanut butter and oil until smooth. Let cool for a few minutes, then whisk in the eggs, buttermilk, and vanilla until well blended. To make the icing, put the butter, peanut butter, and buttermilk in a saucepan and bring to a full boil (it may separate; that's okay). Take off the heat and beat in the vanilla and powdered sugar, adding a cup at a time, until the icing is smooth. Add more buttermilk as needed. Pour the hot icing over the warm cake, working quickly because the icing sets up immediately. Spread evenly over cake. DROOLING! I totally remember this cake and haven't had it in years. YUM. Bookmarked. I don't think I have ever had this cake before...and since we are huge fans of peanut butter, this is definitely a must-bake for me! It looks seriously yummy and addictive. I have never had such a cake, it looks so moist and delicious, I can just imagine the taste! It looks wonderful, but I'll bet that it's been banned from schools due to allergies. Sad for everyone else, no doubt about that. I have not had the pleasure of enjoying peanut butter cake... I can tell you I would love it. With a tall glass of whole milk, perfection. I'm sitting here with a cup of tea that desperately needs a piece of this cake to go with it! I don't think I've ever had peanut butter cake, and I need to change that. Yum! We had similar cake's in the UK schools but they tended to be vanilla sponges with jam on top, peanut butter wasn't very popular in the UK when I was in school. But I know I want a slice of this one it looks so good. That definitely brings back memories. I don't think I've had a peanut butter cake like this since I was a kid. It definitely makes me want to bake one -- pronto! I missed out on this cake as my mother always packed my lunch for me to take to school. It really sounds like a good cake. That looks so good, I love peanut butter! There's a restaurant that makes a mean peanut butter pie that I am always craving, but I've never had peanut butter cake! It sounds wonderful. Oh this sounds great! I love peanut butter but I have never tried making a cake like this...yet!